Water Tower Music (WTM39489) - 128 min. 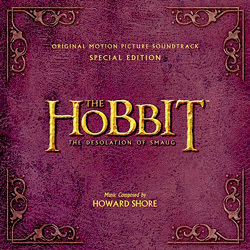 Composed by Howard Shore, except 'I See Fire' which is written, produced and performed by Ed Sheeran. Orchestrations by Conrad Pope, James Sizemore. New Zealand Symphony Orchestra recorded in Wellington Town Hall and conducted by Conrad Pope. London Voices Choir recorded at Abbey Road Studios, with Choir Masters: Terry Edwards, Ben Parry. Choral text by Philippa Boyes with Choral Text translations by David Salo. Liner Notes by Doug Adams. Tiffin Boys'Choir with Choir Master: Simon Toyne. Album Mastered by Simon Gibson and edited by James Sizemore. Score recorded by Simon Rhodes, Peter Cobbin, Sam Okell and music recorded by Peter Cobbin. Dealoz list of US, UK and Canadian sources from which to purchase, selling for about $20us. Amazon UK is offering it for about 17#. They are also offering it as an MP3 download with a pdf containing the digital booklet for about 9#.. It is also available for purchase at iTunes as a download for about $10us. Featuring Original Music by Academy Award Winner Howard Shore, with an original song 'I See Fire' Performed by Singer-Songwriter Ed Sheeran, this Special Edition features twelve extended tracks, a bonus track, expanded liner notes and interactive sheet music packaged in a hardcover leatherette DigiBook with two disc pockets and a stapled-to-spine 34 page booklet. The booklet contains images from the film in addition to the usual credit listings. It also has a 14 page music analysis of the score by musicologist Doug Adams (See 'The Music of The Lord of the Rings Films'). Finally, there is a fold-out that contains a portion of the score to the "Barrels Out of Bond" chapter and instructions about how to unlock the interactive content embedded in this sheet music. Sarah Stanley Review in the University of York Newspaper (UK).